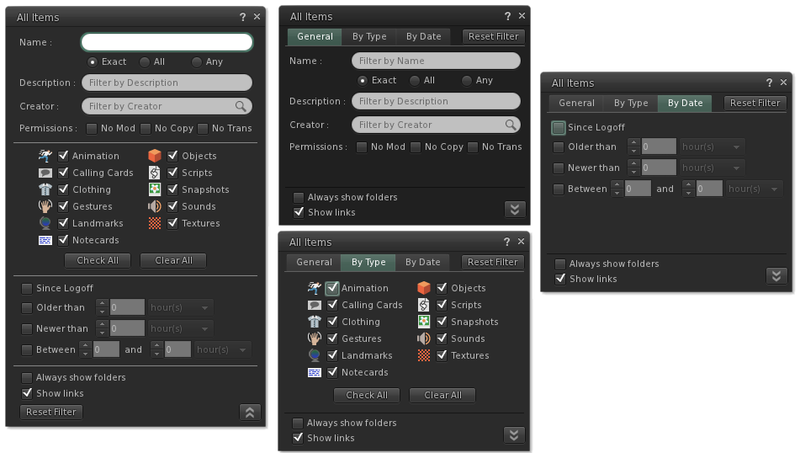 If you right-click one of your own folders you’ll have a new option to treat it as if It was a system folder: this means that it sorts at the top with the other system folders if you have “Sort System Folders to Top” checked and it will also prevent you from accidentally deleting it. This doesn’t actually mess with your inventory but is rather a local setting; if you use multiple computers then you’ll have to do it for each once (I’m working on that! ), and it won’t apply to any other viewers. As you might be able to spot from the screenshot above I did some minor layout changes to the inventory context menu; with the new inventory options and LL’s new “Use as default” it felt like the menu was getting rather bloated; so in order to keep it manageable I decided to fold all inventory creation options into the “New Items” sub menu. If you have any thoughts to share (good or bad) please do use the feedback option in the viewer; for things like this the only way I know whether a change worked out for the best or not is if you all tell me 😊. Firestorm added a convenient “Replace Links” feature which was then contributed back to Linden Lab and is present in R12 as well (you can read more about this on LL’s blog or Inara’s blog posts). As an extra convenience I added a “Take (Replace Links)” option to the context menu of a rezzed object which will take the item into inventory and pre-fill the replace links floater. 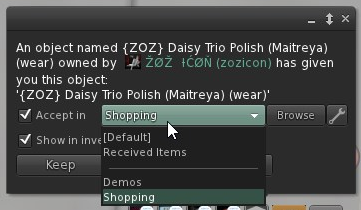 This is definitely one of the most important features of this releases and one that (I hope) will have the most impact on how you deal with shopping in Second Life and keeping your inventory manageable. 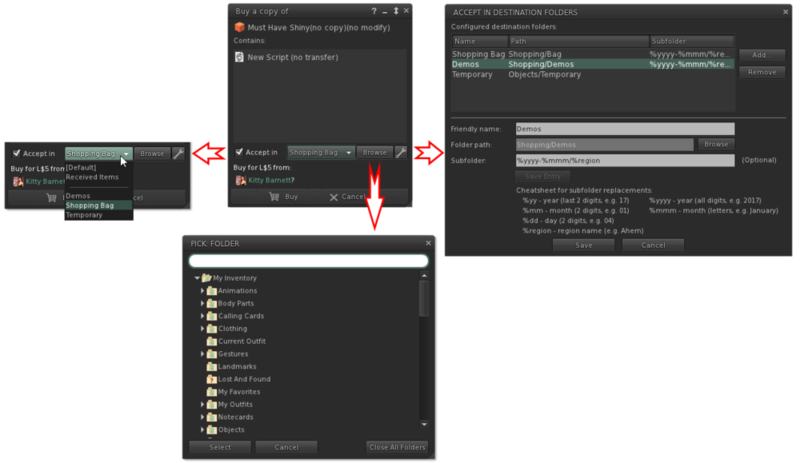 I’ve written about this before (see http://blog.catznip.com/2017/03/catznip-r12-three-days-of-teasers-day-1.html) so I won’t go into minute detail but essentially this feature attempts to keep your inventory more manageable and organized by letting you decide where a folder should go at the time you receive it. Imagine going to a shopping event; some of the things you’ll want to buy on the spot, while others you’ll want to grab a demo of. Maybe you try it on the spot, or maybe you’ll accumulate all the demos and then teleport home to try things on at your own leisure. Most likely you’ll end up with a bunch of new top level folders cluttering up your inventory and some new things in your Objects folder. And if you sort that then and there anything you bought will end up hopelessly lost. With this feature, you’ll now get a new drop-down when you get offered a folder (or on the buy floater as well) letting you decide where something should be saved to so for me personally, anything I buy I put into my “Shopping Bag” folder, and any demos I want to try I divert to my “Demos Only” folder. This means that if – for instance – I go to this month’s Uber event and buy something it’ll be auto-sorted to a special “Shopping / 2017-December / Uber” folder and even if I don’t unpack or touch a single box I’ll still have some semblance of a sorted inventory. As useful as the above is, it soon became apparent that boxed up items or demos still presented a problem: I like to demo things at my own house but if the demo is boxed up that means that the demo object is in the events folder (since I acquired it there), but the unboxed folder will be in a folder for my home region since that’s where I unpacked it. Clearly there needed to be some way to keep the contents of an unpacked object near to where that object itself lives in your inventory and this new feature was born: for the most part (and if I did everything correctly) you shouldn’t even notice this too much and things will just work as you’d expected them to. If the accept in destination is prefixed with the word “Object:” it simply means that I’m trying to be clever and offering to let you unpack an object into the same folder the item lives in rather than some completely unrelated folder elsewhere in your inventory. The next big inventory feature is the completely revamped inventory filter floater which comes in both an expanded (tall) version on the left, or the more compact (tabbed) version on the right. Simply click the arrows in the bottom right to switch between one and the other. Play around with these a little bit and you’ll see that they’re extremely useful tools to let you find that specific item you’re looking for that would have otherwise been much harder to locate. Once you’re familiar with the “Exact”, “All” and “Any” concept pay attention to the shorthand code that’s appearing in the main inventory floater as well. You don’t need to actually specify a search type on the filter floater, you can simply prefix your regular search words with “any:” and “all:” as well.